Rabbit polyclonal E Cadherin antibody. Validated in WB, IHC, ICC/IF and tested in Human, Pig. Cited in 93 publication(s). Independently reviewed in 13 review(s). Recombinant fragment within Human E Cadherin aa 600-750. The exact sequence is proprietary. Our Abpromise guarantee covers the use of ab15148 in the following tested applications. WB 1/500. Detects a band of approximately 120 kDa. IHC-P 1/30. for 10 min at RT. Staining of formalin-fixed tissues requires boiling tissue sections in 10mM citrate buffer, pH 6.0 for 10 min followed by cooling at RT for 20 min. ab15148 staining E Cadherin in Human breast cancer MDA-MB-231 cells by ICC/IF (Immunocytochemistry/immunofluorescence). Cells were treated with ehanol (vehicle) as control or Origanummarjorana extract for 24 hours. Cells were fixed with 4% paraformaldehyde, permeabilized with 0.1% Triton X-100 in PBS and blocked with 5% milk for 30 minutes at room temperature. Samples were incubated with primary antibody overnight at 4°C. An Alexa Fluor 488-conjugated Goat anti-rabbit IgG (H+L) polyclonal (1/200) was used as the secondary antibody. ab15148 staining human MCF10A cells by ICC/IF. Cells were fixed with paraformaldehyde and blocked using 10% serum for 30 minutes at 25 °C. The primary antibody was diluted 1/25 in TBST and incubated for 1 hour at 25 °C. 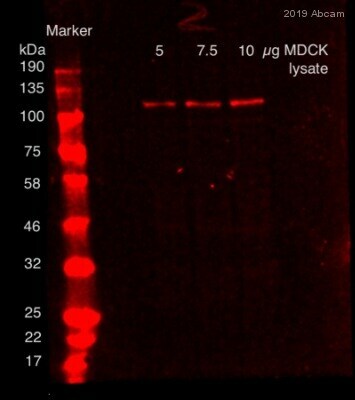 An Alexa Fluor® 555 goat anti-rabbit was used as the secondary antibody. Immunohistochemistry (Frozen sections) - Anti-E Cadherin antibody (ab15148)This image is courtesy of an anonymous Abreview. ab15148 staining E Cadherin in Human AGS Gastric Carcinoma tissue sections by Immunohistochemistry (Frozen sections). The sections were acetone fixed and blocked in 5% serum for 1 hour at 23°C. The primary antibody was diluted 1/50 in blocking buffer and incubated with the sample for 1 hours at 23°C. An HRP-conjugated Goat polyclonal to Rabbit IgG, diluted 1/200, was used as the secondary. ab15148 staining E Cadherin in Pig Cervix uteri tissue sections by IHC-P (Formaldehyde-fixed, Paraffin-embedded sections). Tissue samples were fixed with formaldehyde and blocked with 10% goat serum for 1 hour at 37°C; antigen retrieval was by heat mediation in 10mM citrate at pH 6 for 2 minutes. The sample was incubated with primary antibody (1/50) at 4°C for 12 hours. An HRP-conjugated goat polyclonal to rabbit IgG (undiluted) was used as secondary antibody. Immunohistochemical staining of formalin fixed paraffin embedded human skin using ab15148. ab15148 staining E Cadherin in human stomach tissue section by Immunohistochemistry (Formalin/PFA-fixed paraffin-embedded sections). Tissue underwent formaldehyde fixation before heat mediated antigen retrieval in Citrate pH 6.0 and then blocking with 5% serum for 1 hour at 23°C was performed. The primary antibody was used diluted 1/50 and incubated with sample for 1 hour at 23°C. A HRP conjugated goat polyclonal to rabbit IgG was used undiluted as secondary antibody. ab15148 staining E cadherin in Human AGS Gastric carcinoma cultured cells by ICC/IF (Immunocytochemistry/immunofluorescence). Cells were fixed with formaldehyde, permeabilzed with 0.025% Trton X-100 in TBS and blocked with 5% serum for 1 hour at 23°C. Samples were incubated with primary antibody (1/50 in blocking buffer) for 1 hour at 23°C. An undiluted HRP-conjugated goat anti-rabbit IgG polyclonal was used as the secondary antibody. Publishing research using ab15148? Please let us know so that we can cite the reference in this datasheet. Please find the completed form below and relevant image attached. 3) Description of the problem: Non-specific bands detected in positive and negative control, I selected the antibody as the reviews displayed a single band detected for E-cadherin which is what I need for my experiments. Protease inhibitors: Protease cocktail inhibitor tablets (Roche). What steps have you altered to try and optimize the use of this antibody? Tested primary antibody concentration at 1/200-1/1000 and increased blocking time from 30 minutes to 60 minutes. Thank you for taking the time to complete our questionnaire and contact us. I am sorry to hear you have had difficulty obtaining satisfactory results from this antibody. I would like to reassure you that ab15148 is tested and covered by our 6 month guarantee for use in WB and human samples. In the event that a product is not functioning in the applications cited on the product data sheet, we will be pleased to provide a credit note or free of charge replacement. Reviewing this case, I would like to offer some suggestions to help optimise the results from ab15148. 1.) I recommend to run a no primary control, to make sure that it is not the secondary antibody producing the extra bands at 50 and 90kDa. 3.) Since the smallest extra bands are only in the positive control and it is smaller than the expected band, this could be a degradation band. I therefore suggest to review the proteinase inhibitors and always freshly prepare them. Our customer is looking for anti e cadherin ab that recognizes both mouse and rat in fixed cells (for the staining) and also for live cellimaging. For this reason the customer needs the ab that recognizes extracellular epitope. Please advise if ab53033 is suitable for this purpose? Thanks in advance for your assistance and reply. The immunogen of ab53033 corresponds to the internal sequence of E-cadherin so this may not suitable as per your requirements. The immunogens of antibodies ab15148, ab77287, ab128804, and ab133597 are located within the extra cellular domain of E-cadherin so these antibodies might be suitable. ab133597 has been tested in ICC/IF with mouse and rat cells so it is the most suitable candidate. However the other antibodies can be offered with either mouse or rat or with ICC/IF 100% Abreview discount. The Abpromise guarantee is with ICC/IF when performed on fixed cells we do not know which antibody would be suitable for live cell imaging so the suitability has t o be determined by the end user. 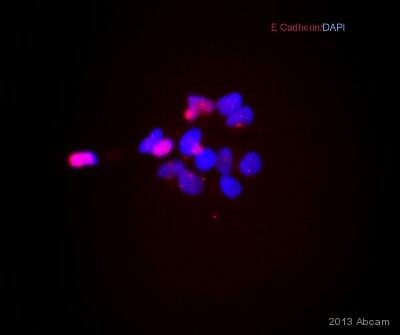 Can you please tell me which of your human E Cadherin antibodies recognize the extracellular domain? I hope this helps, please let me know if you would like me to narrow down the list by any additional criteria. Thanks for your kindly reply, after I contacted with this customer, she would like to have a credit note. Therefore, would you please help this customer to create a credit note? Thanks for your kindly assistance. Thank you for confirming this information and for your help and cooperation with this case. As requested, I have asked our accounting department to issue you with a credit note. This can then be redeemed against the invoice of a future order. As usual if you have any further questions regarding this credit note, please contact the accounts department by email at creditcontrol@abcam.com. The reference number, or credit ID, is xxxx. Please refer to this number in any correspondence with the accounting department. I would like to wish the customer good luck with their research. The technical team is always at your service, should you require further expert advice. Thanks for your kindly reply, after I contacted with this customer, she reply your question as follow: 1. Positive control: Huh7, ab1416:the user says it can work 2. Yes, we have checked E-cadherin expressed in Huh7 by real time PCR. Furthermore, this customer indicated she also used the ab53033 and conducted wb assay with the same condition as this time, and the results show strong signal, I attached the image in this letter, could you please help this customer to solve the problem? Thank you for confirming this information and for your help and cooperation with this case. As mentioned before, the protocol looks absolutely fine to me and the results with ab53033 are excellent. I can suggest the customer has regrettably received a bad vial. Therefore, I would be pleased to offer your customer a replacement or a credit note. I look forward to your reply.